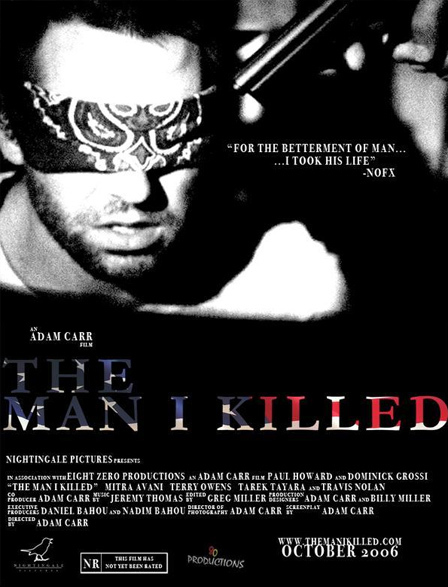 The Man I Killed is a short that I worked on in Mid 2006. The film is written and directed by Adam Carr. The story, which the title and these pictures don't show, is more then about a "man getting killed". Jason, the lead character, is discontent with the world and the complacency of humanity. He doesn't know what the answers are to this life, he just knows that things are wrong. By the end of the film, various events lead him to act on his feelings of discontentment and revolution. The production was an intense one, with the extremely long hours, traveling (virtually a new city each day of filming), and the specific acting demands required for the character (for example, Jason speaks Arabic), but I am very proud of my work and the film. I believe that this film will stand out from so many others due to it's talented crew, writer, director and it's timely subject matter. The film had it's World Premiere October 28th at the Iffy NTX Film Festival (Independent Film Festival of North Texas).